The company I work for makes the RAMSAN. Its the way I got hooked on EVE. 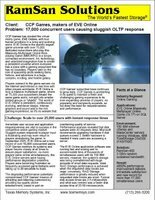 When the CEO of CCP came into Texas for a gaming confrence he stopped by our office and handed out a bunch of 30 day trials. Its when I got hooked (and about 5 other engineers at our company.) Unfortunatly I never played EVE prior to the RAMSAN installation, so I just have to take everyone's word that it did make the game better. Well take my word for it, it's had a profound impact. Lag is now almost none existant and everything is fast. Great piece of tech you got there! By the way, you wouldn't mind if I posted you photo of your 2-monitor set-up? You got me dreaming here!